LATHAM — The Fort Plain boys won the Western Athletic Conference Bowling Tournament, while the girls placed second in the tournament bowled at Spare Time Lanes. The Hilltoppers edged Bishop Gibbons 2,732-2,727 in total pins to win the tournament championship. The Lady Hilltoppers were runner-up to Middleburgh 2,607-2,313. Middleburgh placed third in the boys standings with 2,705 pins, while Canajoharie was fourth with 2,532, followed by Fonda-Fultonville (2,300), Oppenheim-Ephratah/St. 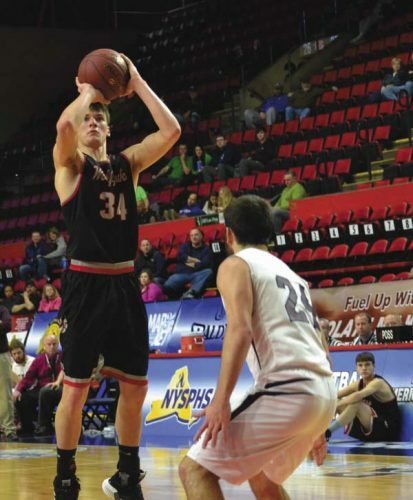 Johnsville (2,370), Duanesburg (2,230), Mayfield (2,185), Schoharie (2,091) and Berne-Knox-Westerlo (1,635). Canajoharie placed third in the girls tournament with 2,148 pints, followed by Schoharie (2,125), Mayfield (1,912), Duanesburg (1,896), Berne-Knox-Westerlo (1,810), Fonda-Fultonville (1,444) and Oppenheim-Ephratah/St. Johnsville. Bishop Gibbons’ Alex Belcher rolled the high triple at the tournament with a 651, while Middleburgh’s Andrew Miaski turned in the high single with a 235. Middleburgh’s Carolyne Shultes rolled the high triple for the girls with a 635, while Middleburgh’s Jaidyn Rose had the high single of 246. Bishop Gibbons won the regular-season boys title over Fort Plain, while Middleburgh won the regular-season girls title over Schoharie. Middleburgh’s Tyler Mann earned high average on the season with a 201, while Middleburgh’s Andrew Miaski recorded the high triple of 756 and Duanesburg’s Eland Colon had the high single with a 290. Duanesburg’s Kylie Largeteau finished the season with the high average for the girls with a 199, while Rose recorded the high triple with an 811 and Shultes took high single with a 255. Connor barnes led the Fonda-Fultonville boys with a 508 series, while Ethan Auspelmyer added a 504 series. Mureen McGaha led the FFCS girls with a 295 series. Named first-team all-stars for the boys were Canajoharie’s Dian Dimezza, Middleburgh’s Miaski, Bishop Gibbons’ Joe Matala and Belcher and Duanesburg’s Tyler Drexel. Second-team all-stars include Bishop gibbons’ Evan Sawitkii, Colon, Fort Plain’s Anthony Paradiso and Brady Fureno and fonda-Fultonville’s Conner Barnes. Middleburgh’s Carolyne and Cameryn Shultes and Rose were named first-team all-stars for the girls along with Schoharie’s Mandi Williams and Tori Harrington. Fort Plain’s Rachel Zupparddi was a second-team selection along with Duanesburg’s Cassie Schanz, Middleburgh’s Julia Bingham and Schoharie’s Truah Mason and Mary Palameri.